The display case at Cacao Nuts & Chocolates in Jamaica Plain is filled with luscious, handmade chocolates. The shop opened in July and offers a nut bar with more than a dozen choices — cashews, macadamias, pecans, Turkish pistachios, Brazil nuts, and almonds flavored with cayenne, cinnamon, or cocoa; nut mixes with chocolate and coconut chips, and more ($7.99 to $18.99 per pound). It’s a perfect place for Valentine’s Day treats. Leo Baez opened the shop in July with his fiancé, Perla Rosario, spiffing the space up with a beautiful wood counter, pendant lighting, and pale gray walls. Baez roasts the nuts in small batches in a roaster in the back of the store. Rosario crafts the chocolates using Valrhona couvetures ($42 per pound). 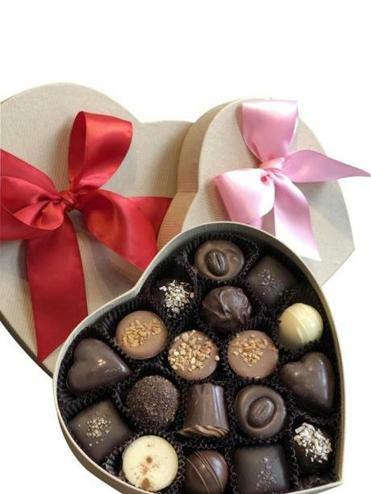 She fills heart-shaped boxes for Valentine’s Day with an assortment of dark-, milk-, and white-chocolate ganache-filled bonbons and Champagne and cafe au lait truffles, and chocolate cups full of creamy hazelnut. Solid dark chocolate hearts, some filled with praline, are also available. “I like to stay more traditional and simple,” says Rosario. “But I do experiment with different flavors.” One shelf is lined with chocolate bars from local confectioners, like Taza, Goodnow Farms, and Harbor Sweets. When Baez is roasting, an enticing toasty aroma wafts through the shop, otherwise a sugary sweet scent fills the air. Baez was born in and spent his childhood in the Dominican Republic, and Rosario was born here but her family is Dominican. “Cashew trees were everywhere in my country,” says Baez. “I was obsessed with cashews and would eat the cashew fruit from the tree every day.” Rosario’s family owns a cacao farm in her homeland. Photos of the cocoa harvesting hang on the walls, including one with her uncle. “Making chocolate from bean to bar always fascinated me,” says Rosario. “I’ve always had this passion.” Someday the chocolatier hopes to import her family farm’s cacao. If you stop by, you might also want to try their stellar cup of spicy dark hot chocolate ($4.99). It’s inspired by the kind Baez would dink in his native country. 660 Centre St., Jamaica Plain, 617-390-2400, www.cacaonuts.com.